Alien: Covenant returns to its roots in horror. In 1979, Ridley Scott convinced audiences around the world that “in space, no one can hear you scream.” And the newest film in the line of prequels leading up to the terrifying events aboard the Nostromo, attempts to make up for the rejection of 2012’s Prometheus as a true prequel to Alien. Fortunately for fans of the franchise, Alien: Covenant is mostly successful at delivering what audiences loved about the original and missed in the subsequent Cameron and Fincher movies–the trademark horror of the xenomorph and facegrabbers. 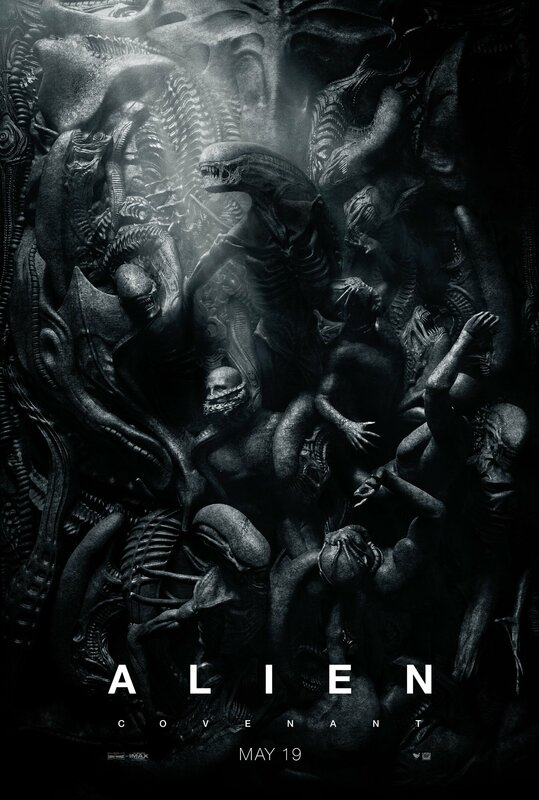 Starting off like Prometheus and finishing more like the original Alien, the newest film in the nearly 40-year-old franchise will have you screaming, cringing, and completely immersed in blood-curdling terror. That is, until you realize that only some questions from Prometheus are answered, and all new questions about events in this movie are generated and left unanswered. That appears to be Ridley Scott’s Achilles heal: always leaving more questions unanswered than providing closure or exposition, thus prohibiting the movie from being as great as it certainly had the potential to be. With one more film between this current installment and 1979’s Alien, perhaps there will be far fewer unanswered questions and provide the history for which fans are looking. On a colonization mission, the complement of the Covenant is traveling into deep space towards a new planet that earth’s humans hope to make a new home. After encountering some severe spacial turbulence enroute to the destination, the crew of the Covenant intercept a transmission from an uncharted planet that, according to the sensors, appears to be a complete paradise. After some deliberation, it’s decided to head for this new planet. Most of the time, when something is too good to be true, it usually is. Led by the new captain Oram (Crudup) and first officer Daniels (Waterson). After an attack from an alien species, the crew is rescued by David (Fassbender), a synthetic android-like human, who is the only remaining survivor of the Prometheus expedition from some years earlier. Unbeknonst to the crew and scientists of the Covenant, they are about to come face to face with the most terrifying nightmare imaginable–make that–an unimaginable fight for survival when paradise turns to hell. One of the first technical elements that fans of Alien will notice is the opening title sequence. It is reminiscent of the manner in which the opening credits and title of the original were revealed in the emptiness of space on screen. I appreciated this homage to the original because it set me up to prepare for an Alien movie and not a second Prometheus. Perhaps that does not seem important to non-fans; but to make a long story short, while Scott was in the conceptual phase of a sequel to Prometheus (prequel to Alien), he was told by the studio that audiences didn’t want another Prometheus–they wanted Ridley Scott’s Alien. And now the rest is history. In order to best understand the flaws of Alien: Covenant it’s necessary to understand the similar flaws of Prometheus. One of the many diegetic and technical problems with Prometheus was the fact that there was little direct connection to Alien and it felt like a whole new franchise and not an extension of the original. This lack of connection is best represented by the number of unanswered questions dwarfing the answered ones. Essentially, audiences only learned about David’s origin and, to a lesser extent, why that particular planet. But enough about Prometheus, we are here to talk Alien: Covenant. Although vastly improved, Covenant also leaves audiences with many unanswered questions; albeit, it is successful at making up for many of the diegetic flaws of the preceding film. To get into the questions would reveal too much about the film and perhaps hint at some spoilers, so I won’t go into specifics. But enough about the flaws of this otherwise exciting and well-produced film–just know that the writing is weak but hopefully will be better in the next installment. The most impressive elements of the movie are related to the cinematography, editing, and visual effects. From the sweeping landscape shots to intimate closeups of the xenomorph and its victims, Covenant is absolutely visually stunning. There is even a mild romantic encounter between David and a member of the Covenant crew that was shot incredibly well and strategically placed in the narrative. Where the story is weak, Scott makes up for in creating an impressive cinematic experience for long-time and new fans alike. There are even shot sequences that are taken directly out of Alien. Often times, I am extremely critical of computer-generated effects and characters versus practical effects and animatronics–and for good reason–nothing can replace the way real light bounces off real objects and is really captured by the glass lenses on a camera. Furthermore, it’s rare that a character react in genuine fear to an object, villain, or murderous alien that is not really present on set. However, the combination of CGI and practical effects in Covenant is breathtaking and convincingly real. You will almost feel the facegrabber latching onto you and the xenomorph’s wet acid-breath on your skin. Aside from the unanswered questions still residing in the minds of those who have seen the film, Covenant fails to live up to Alien in another rather conspicuous way. For everything that this film did right and make up for (in respect to Prometheus), it lacked any memorable crew members–more specifically–this film differs from Alien by not developing Dani(els) to be the strong female character that she had the potential to be. Dani could have been Covenant‘s answer to Sigourney Weaver’s Ripley in Alien. One of the diegetic elements that is most talked about and is often the topic of horror film humanities classes is the breaking of gender roles and heteronormative expectations by Ripley in Alien. Perhaps that is why Alien is almost avant-garde in the cinematic experience whereas Covenant is impressive but does not typify the art of cinematic storytelling nor contributes to groundbreaking character-types. Beyond strong female lead, the film simply fails to leave the audience with any one memorable character period. No one will be talking about any one particular character years from now. Both the unanswered questions and the lack of memorable significant characters can be traced by to one root cause: flawed writing. If you loved the original Alien, then you will mostly enjoy Alien: Covenant. The experience is equally terrifying as it is beautiful. Whether you have seen Prometheus or not will not affect your enjoyment factor in this film. If you have seen Prometheus, then I would suggest watching the Ridley Scott short film The Crossing because it ties Prometheus to Alien: Covenant. Think of it as an extended prologue. This short film helps audiences to make the connection between the two films in hopes that it does answer some otherwise unexplained circumstances and events. After watching this film, I have an urge to rewatch the original in order to begin making those direct connections between this one and Alien. With one more film to release to finalize the events between Prometheus and Alien, I am eager to have my remaining questions answered. Bottom line: Alien: Covenant demonstrates Scott’s newfound commitment to return audiences to the space horror that makes the original so iconic.